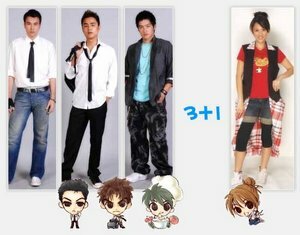 Xia Tian, Jia Jiang, Fang Wei, Bulu all four grew up on Westside Street together and currently study in Ying Ye School. One month away from graduation. Xia Tian's dad is a police officer in Westside Street and is retiring tomorrow. But just on that day, they all had a fight with the Dinosaur gang in the school and were almost expelled by the principal. Officer Xia went to settle the conflict and not only did it not get settled, his gun got misplaced by the principal too. Everyone thus discussed things over and decided that AJ they all will remain in the school and they must find the gun within the one month of graduation to let Officer Xia retire peacefully and happily. Jia Jiang, Fang Wei and Bulu then can successfully graduate. While finding the missing gun, they discovered that a ex-convict Grey Wolf who escaped from prison is possibly connected with the missing gun and even more surprisingly, the Grey Wolf is actually having close communication and contact with students in Ying Ye.